I love Halloween, New Year’s, and Valentine’s Day. I really go in for dressing up and putting on a show. I love the big parties and intoxicated kisses at midnight. I love the unabashed celebration of romance. But I like it to be classy and tasteful– not sultry or vulgar. Not overly sweet or insincere. Oh, and I love, love, looooo-ooo-oove FOOD– candy, desserts, and savory meats with carb-filled sides! Halloween is just around the corner (Happy Birthday, Baby Brother! ), and then before you know it there’s First* Thanksgiving, Second* Thanksgiving, (Third*) Actual Thanksgiving, First* Christmas, Second* Christmas, (Third*) Actual Christmas, New Year’s Eve, and our anniversary followed shortly thereafter by Valentine’s Day. *The first, second, and third iterations of the food holidays are required due to integral parts of my family working “X weeks on, X weeks off” and missing the actual holidays. No one complains about the need for so many food holidays, though! So, in a spirit of holiday cheer, I have been inspired to undertake a project for the four nieces between the ages of 5 and 7. 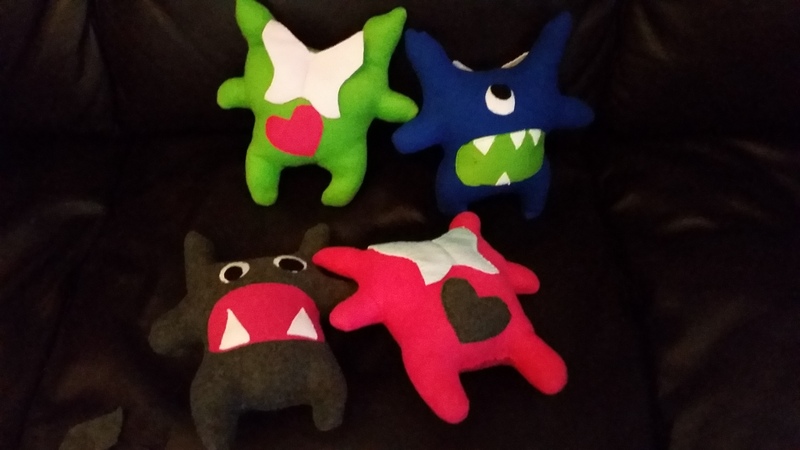 I want to write a story for them, have it published, and give them a stuffed companion that goes along with the book. 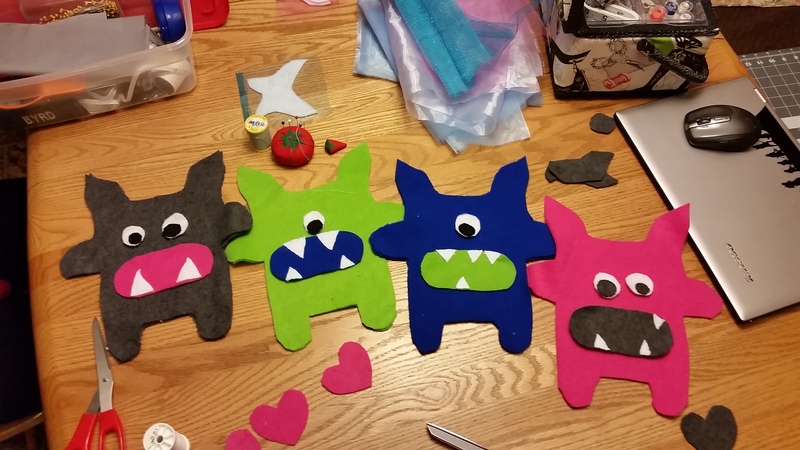 Last night (and the night before), my mom and I sat down and sewed four little fleece monsters with fairy wings. They turned out way nicer than I expected (considering that I free-handed the “pattern” and still haven’t mastered sewing a straight line). I used cheap fleece from Wal-Mart, and I had the stuffing from a project I failed to complete last February. I’m so proud of how these little monster fairies turned out! I seriously can’t even sew a straight line yet, and this was super easy to do. The monsters are really forgiving if you have imperfections, and the fleece was stretchy enough to hide the many mistakes I made. I may never pay for stuffed animals again! This entry was posted in All, Musings, Sewing. Bookmark the permalink.